We introduce Technetium-99m instead of Indium-111 labeled octreotide in the last quarter of 2012. In our database, there were 58 patients who had technetium-99m-octreotide (Tc-99m-OCT) scans done between January 2013 and December 2016. Forty-one patients meet our inclusion criteria; that were histopathology proven somatostatin positive tumors, biochemical evidence of somatostatin tumors, Technetium-99m labeled octreotide scan, CT, and MRI. They were 21 males and 20 females with age range of 15–75 years (mean age of 42.7 years) [Table 1]. The findings on the Tc-99m-OCT scans were correlated lesion by lesion to the available MDCT and MRI scans. The Tc-99m-OCT showed true positive results in 23 patients, whereas the CT and MRI showed true positive results in 18 patients. The Tc-99m-OCT showed one false-negative result in a patient with incidental finding of the left retroperitoneal mass, the histopathology of which was a well-differentiated paraganglioma. 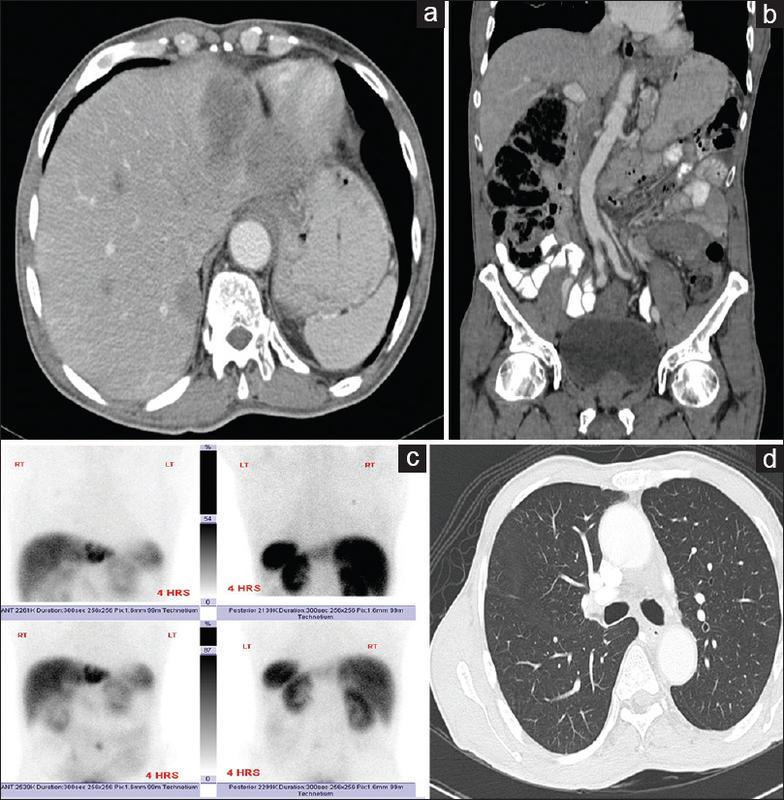 The CT and MRI, on the other hand, showed false-positive result in one patient with carcinoid tumor of the appendix, and few mesenteric lymph nodes and the patient was upstaged metastatic disease. The Tc-99m-OCT scan was performed to confirm the CT findings, but it showed no uptake in the mesenteric lymph nodes, on 6 months' follow-up CT scan, the mesenteric lymph nodes resolved and the patient remained disease-free after 2 years of follow-up. Furthermore, the CT and MRI showed false-negative results in five patients, in which the TC-99m-OCT scan detected metastasis in the bones, lung and retroperitoneal lymph nodes, resulting in upstaging of those patients [Table 2]. One of the patients in this cohort was a 47-year-old female who is known to have multiple endocrine neoplasia type 1 (MEN 1). She presented with severe diarrhea, and she was investigated for NET. The postcontract CT scan of the abdomen and pelvis revealed no abnormality apart for a small, 7 mm, benign-looking preduodenal lymph node. She then had Tc-99m-octreotide scan which revealed focal uptake in the preduodenal lymph node and intense uptake in the proximal small bowel [Figure 1]. For further confirmation, the patient was sent overseas for Gallium-68-DOTA scan which revealed intense, abnormal uptake in the stomach, duodenum, pancreas, and preduodenal lymph node. The patient underwent Whipple's procedure, and the histopathology report came as multiple gastrinomas in the stomach, duodenum, pancreas, and one preduodenal metastatic lymph node. 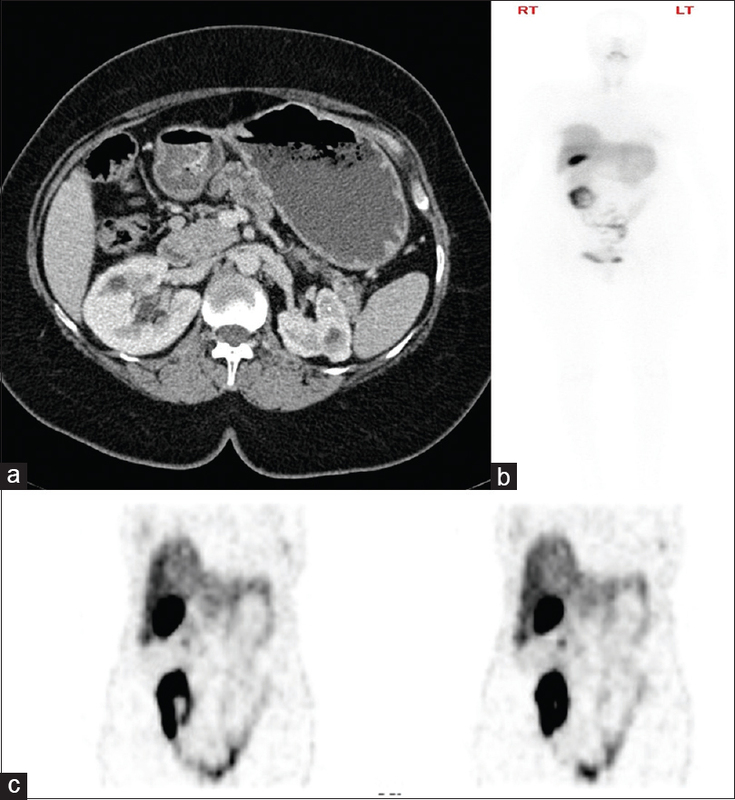 In a second patient, who was a 72-year-old male with known NET of the colon and a single metastasis to the liver, the postcontrast CT scan of chest and abdomen showed the known metastatic lesion in the liver with a small, 9 mm, mesenteric lymph node of query significance. The Tc-99m-octreotide scan showed octreotide avid lesion in the liver, focal uptake in the mesenteric lymph node and a small, 4 mm, octreotide avid lung nodule that was overlooked in the CT scan as it was solitary and small, denoting additional metastatic foci and changing the surgical management in this patient [Figure 2]. Another patient who was 29-year-old female known as MEN1 and the postcontrast CT scan showed pancreatic lesion. The octreotide scan upstaged this patient by showing additional foci of octreotide avid lesions in the right breast and left distal femur in addition to the known lesion in the pancreas. Additional examples of octreotide scan upstaging the patients were in a 33-year-old female, known to have medullary thyroid cancer. Postcontrast CT chest that was done as part of the disease surveillance showed left-sided cervical lymph nodes only. However, the octreotide scan showed the uptake in the cervical lymph nodes in addition to focal uptake in the left clavicle. Reviewing the CT images revealed that there was a destructive lesion involving the distal aspect of the right clavicle, as this was at the tip of the field of view, it was overlooked on the CT scan. For decades radiolabeled somatostatin analog, (DTPA-[D-Phe1]-Octreotide) – Indium-111 (In-111) was used in imaging NET. In our institution, indium-111-octreotide scans were not performed for years mainly due to the high cost and availability. Patients with NETs were staged and operated-on based on the findings on CT and MRI only. In 2012, we started using Tc-99m instead of In-111 for the octreotide scan, and this solved the issues of availability as the octreotide is readily available as a cold kit in our department. It is also much cheaper than buying the In-111-labeled octreotide; and the overall image quality with Tc-99m is much better than those with In-111. In both Tc-99m and In-111-labeled octreotide, the spleen is the highest exposed organ (the critical organ). The estimated absorbed dose of the spleen with Tc-99m-OCT in mGy/MBq is 0.030 and that of In-111-OCT is 0.665. The risk-weighted equivalent dose to the whole body or “effective dose” is measured in (mSv/MBq). The effective dose of Tc-99m-OCT is much less than that of In-111-OCT, 0.0056 and 0.117, respectively [Table 3]. In addition, gamma Exposure rate at 1 cm from 1 mCi of Tc-99m is 720 mR/hr and that of In-111 is 3200 mR/h, i.e., the exposure of the workers form the In-111 is 4.4 times that of Tc-99m. Plöckinger U, Rindi G, Arnold R, Eriksson B, Krenning EP, de Herder WW, et al. Guidelines for the diagnosis and treatment of neuroendocrine gastrointestinal tumours. A consensus statement on behalf of the European Neuroendocrine Tumour Society (ENETS). Neuroendocrinology 2004;80:394-424. Kwekkeboom DJ, Krenning EP, Lebtahi R, Komminoth P, Kos-Kudła B, de Herder WW, et al. ENETS consensus guidelines for the standards of care in neuroendocrine tumors: Peptide receptor radionuclide therapy with radiolabeled somatostatin analogs. Neuroendocrinology 2009;90:220-6. Oberg K, Castellano D. Current knowledge on diagnosis and staging of neuroendocrine tumors. Cancer Metastasis Rev 2011;30 Suppl 1:3-7. Rothenstein J, Cleary SP, Pond GR, Dale D, Gallinger S, Moore MJ, et al. Neuroendocrine tumors of the gastrointestinal tract: A decade of experience at the princess margaret hospital. Am J Clin Oncol 2008;31:64-70. Abbruzzese JL, Abbruzzese MC, Lenzi R, Hess KR, Raber MN. Analysis of a diagnostic strategy for patients with suspected tumors of unknown origin. J Clin Oncol 1995;13:2094-103. Sandler MP, Coleman RE, Patton JA, Th Wackers FJ, Gottschalk A. Diagnostic Nuclear Medicine. 4th ed. Philadelphia, PA: Lippincott Williams and Wilkins; 2003. p. 734. Faintuch BL, Pereira NP, Faintuch S, Muramoto E, Silva CP. Lanreotide and octreotide complexed with technetium-99m: Labelling, stability and biodistribution studies. Braz J Pharm Sci 2004;40:101-8. Decristoforo C, Melendez-Alafort L, Sosabowski JK, Mather SJ 99mTc-HYNIC-[Tyr3]-octreotide for imaging somatostatin-receptor-positive tumors: Preclinical evaluation and comparison with 111In-octreotide. J Nucl Med 2000;41:1114-9. Imperiale A, Rust E, Gabriel S, Detour J, Goichot B, Duclos B, et al. 18F-fluorodihydroxyphenylalanine PET/CT in patients with neuroendocrine tumors of unknown origin: Relation to tumor origin and differentiation. J Nucl Med 2014;55:367-72. Banerjee SR, Pomper MG. Clinical applications of gallium-68. Appl Radiat Isot 2013;76:2-13. Stabin MG, Breitz HB. Breast milk excretion of radiopharmaceuticals: Mechanisms, findings, and radiation dosimetry. J Nucl Med 2000;41:863-73. Papotti M, Bongiovanni M, Volante M, Allìa E, Landolfi S, Helboe L, et al. Expression of somatostatin receptor types 1-5 in 81 cases of gastrointestinal and pancreatic endocrine tumors. A correlative immunohistochemical and reverse-transcriptase polymerase chain reaction analysis. Virchows Arch 2002;440:461-75. Schmid HA, Schoeffter P. Functional activity of the multiligand analog SOM230 at human recombinant somatostatin receptor subtypes supports its usefulness in neuroendocrine tumors. Neuroendocrinology 2004;80 Suppl 1:47-50. Schmid HA. Pasireotide (SOM230): Development, mechanism of action and potential applications. Mol Cell Endocrinol 2008;286:69-74. Grimes J, Celler A, Birkenfeld B, Shcherbinin S, Listewnik MH, Piwowarska-Bilska H, et al. Patient-specific radiation dosimetry of 99mTc-HYNIC-tyr3-octreotide in neuroendocrine tumors. J Nucl Med 2011;52:1474-81. Krenning EP, Bakker WH, Kooij PP, Breeman WA, Oei HY, de Jong M, et al. Somatostatin receptor scintigraphy with indium-111-DTPA-D-phe-1-octreotide in man: Metabolism, dosimetry and comparison with iodine-123-tyr-3-octreotide. J Nucl Med 1992;33:652-8. Sharma P, Singh H, Bal C, Kumar R. PET/CT imaging of neuroendocrine tumors with (68)Gallium-labeled somatostatin analogues: An overview and single institutional experience from India. Indian J Nucl Med 2014;29:2-12. Naswa N, Sharma P, Kumar A, Nazar AH, Kumar R, Chumber S, et al. Gallium-68-DOTA-NOC PET/CT of patients with gastroenteropancreatic neuroendocrine tumors: A prospective single-center study. AJR Am J Roentgenol 2011;197:1221-8. Al-Nahhas A, Win Z, Szyszko T, Singh A, Nanni C, Fanti S, et al. Gallium-68 PET: A new frontier in receptor cancer imaging. Anticancer Res 2007;27:4087-94.